We’re celebrating Shark Week by sharing some of our greatest adventures meeting sharks! First up the Blue Shark!! It’s time to pull on your wetsuit and put on your goggles and head into the ocean to meet today’s animal! Today’s fish has a skeleton made of cartilage and a mouth full of teeth! Maybe we’ll skip the wetsuits and watch these fish from our submarine :)! Blue sharks are called the “wolves of the sea”. 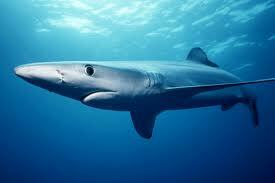 Blue sharks are a beautiful cobalt blue color. They have long pectoral fins. 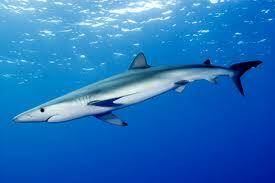 Blue sharks are very fast swimmers and feeders. They have sharp triangular teeth. They migrate seasonally from cooler to warmer waters. Blue sharks have large litters of live pups, up to 100. 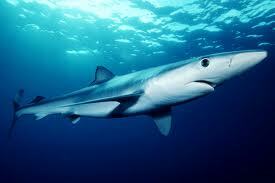 Blue sharks are known to be aggressive towards people, so they are best left alone. We think they are such beautiful and graceful predators. Like other sharks, blue sharks are threatened. We need to make sure that our oceans have these apex predators swimming around for a long time!